Biosand filter effectiveness is greatly influenced by the presence and quality of filter components, the quality of filter construction, and the dimensions of the filter. 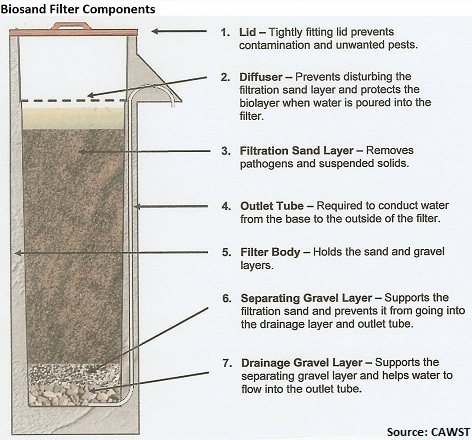 Below you will find a diagram showing the components of a concrete biosand filter. A lid for the filter is required and can be constructed of wood, metal, or plastic. The biggest issue concerning the lid is that it protects the inside of the filter from contamination and that it is sturdy and tight-fitting. The diffuser plate is a metal or plastic plate with holes drilled through it in a uniform pattern. The plate covers the surface of the sand and sits 70mm (2.8 inches) above the top of the sand bed. The uniformity of the holes in the diffuser is important because water trickles through them and onto the surface of the sand beneath it. Uniformity of the holes prevents any disturbance of the sand surface that might occur as water is poured into the filter. Any lack of uniformity or damage to the diffuser causes more water to fall in certain areas. This can encourage the development of "preferential pathways" for the water as it filters through the sand. Preferential pathways allow water to "tunnel" through the sand rather than filtering through it and can allow pathogens to find their way deep into the sand bed, rather than being trapped in the bio-layer. 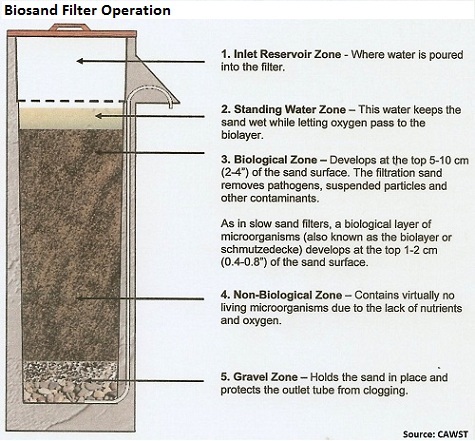 The filtration sand layer is the heart of the biosand filter. It is in the layers of the sand, as the water works its way through the sand, that suspended solids are trapped and pathogens are trapped and killed. The outlet tube conducts water out of the filter after it has been cleaned by finding its way through the sand bed. Disinfection of the outlet tube is an important step in the construction of the filter. The tip of the outlet tube must also be disinfected periodically, since it is exposed and may be contaminated. The filter body makes up the main structure of the filter. The sand bed and the water being filtered are both held together by the filter body. Whether concrete or plastic, a solid, durable, waterproof filter body of the proper dimensions is required. The separating gravel layer is finer than the layer of gravel below it. It supports the sand bed and prevents the fine filter media from penetrating down into the gravel layer below where it could be picked up by the outlet tube. The drainage gravel layer is a larger diameter and allows the filtered water to flow into the outlet tube. How Does a Biosand Filter Work? Pathogens and suspended solids are removed through a combination of biological and physical processes that take place in the biolayer and within the sand layer. These processes include: mechanical trapping, predation, adsorption, and natural death. Adsorption. Pathogens become attached to each other, suspended solids in the water, and the sand grains. Contaminated water is poured into the reservoir on an intermittent basis. The water slowly passes through the diffuser and percolates down through the biolayer, sand, and gravel. Treated water naturally flows from the outlet tube. How Well Does a Biosand Filter Work? Water naturally contains many living things. Some are harmless and others can make people sick. Living things that cause disease are also known as pathogens. They are sometimes called other names, such as microorganisms, microbes or bugs, depending on the local language and country. There are four different categories of pathogens that are shown in Table 1: bacteria, viruses, protozoa and helminths. The physical characteristics of drinking water are usually things that we can measure with our senses: turbidity, color, taste, smell and temperature. Turbid water looks cloudy, dirty or muddy. Turbidity is caused by sand, silt and clay that are floating in the water. Drinking turbid water will not make people sick by itself. However, viruses, parasites and some bacteria can sometimes attach themselves to the suspended solids in water. This means that turbid water usually has more pathogens so drinking it increases the chances of becoming sick. The following Table 1 shows the biosand treatment efficiency in removing pathogens and turbidity. Return to "Intro. to Biosand Filters" from Biosand Filter Components"